Celebrate Nebraska’s 150th birthday today! An important birthday party is coming up today, Wednesday, March 1, at the Boone County Museum. 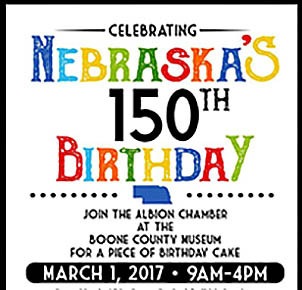 Albion Chamber of Commerce is providing the cake, and the Boone County Historical Society is hosting the event from 9 a.m. to 4 p.m. to celebrate Nebraska’s 150th Birthday. The event will coincide with the 150th anniversary of Nebraska’s statehood, which took place on March 1, 1867. Many special celebrations of Statehood Day are being planned across Nebraska, including one at the State Capitol. All Nebraskans are urged to participate in their local events. Boone Central and St. Michael’s elementary students will be at the museum starting at 1 p.m. on Wednesday. The public is invited to drop in at the museum throughout the day and have a piece of Nebraska Birthday Cake . In conjunction with the Nebraska 150 celebration, the Albion News and Albion Chamber of Commerce are sponsoring a weekly trivia contest. The first contest questions were published Feb. 15, followed by a fill-in-the-blank quiz on Feb. 22. This week’s quiz is a crossword puzzle, “Famous People from Nebraska,” which appears on page 3 of this week’s Albion News. Prizes will be awarded for first and second places in both the 18-under division and in the 19-older division. Prizes in the younger age group will be Albion Family Aquatic Center passes, and prizes for the older contestants will be a 2017 Nebraska State Parks pass (first place) and Chamber Bucks (second place).